This morning’s a double-header, making up for yesterday. Starlight Mints were an indie pop band from Norman, Oklahoma. In August 2000, the band released the album The Dream that Stuff was Made Of. It was a hit in college circles, much like Pavement had been several years earlier. The echoes were appreciated. Last week’s feature of Bryan Ferry got me thinking about solo artists that have made a good fist of leaving their successful bands. Stephen Malkmus’s signature is unmistakable. The one-time frontman for Pavement, arguably the most effervescent group of ’90s indie music, could have suffered under the weight of legacy and expectation. But he took it all in his stride and with a dollop of his humour. ‘Jo Jo’s Jacket’ and the bald dome of Yul Brynner feature on his self-titled debut album. Honourable mentions also go to: Pépé Bradock & The Grand Brûlé’s Choir for ‘Deep Burnt‘; Mos Def for ‘Ms. Fat Booty‘; Shack for ‘Comedy‘; Pete Heller for ‘Big Love‘ and Death in Vegas for ‘Dirge‘. Pavement’s last album had some serious back catalogue competition. The Nigel Godrich-produced Terror Twilight may not be their best, but it was really good and it featured ‘Spit On A Stranger’. Have a great week. This year, Will Toledo has got my attention. He is one of those singer-songwriter that operates as a “band” – in this case, Car Seat Headrest. ‘Drunk Drivers/Killer Whales’ is off the project’s recommended album Teens Of Denial. The fact that this particular track reminds me of the combined output of some this blogger’s favourite bands (Sparklehorse, Beck, Okkervil River, Pavement) is a boon. Have a great week. Some nostalgic thoughts from Liverpool last week. If you’re ever up in the ‘Pool, a trip across the Mersey to Birkenhead is an adventure. It’s the rough end of Merseyside. ‘Two To Birkenhead’ is off On West Kirby County Primary, Bill Ryder-Jones’s third studio album since leaving The Coral. The singer asks to be taken somewhere he’s not likely to forget. Indeed; my memories are of 8 year olds in trackies asking students for cash. While the lyrics make me smile, the sound is a very pleasing distraction, channeling Pavement to great effect. Have a great week. It’s winter my friends and never has an album opened with a colder start than the lyric “Ice Baby”. ‘Summer Babe (Winter Version)’ kicks off Slanted and Enchanted, Pavement’s impertinent and preposterously good debut album. Full of reverb and garage drums, the song was omnipresent during my last college year. Where Icehouse’s Iva Davies tapped into Bryan Ferry’s vocals, Stephen wanted to sound like Lou Reed. During my formative years, I thought that UK output in most music scenes was comparable to, and often better than, their US counterparts. But in the early nineties, and certainly prior to the 1995 release of The Bends by Radiohead, rock music was US-defined. During this time, UK creativity seemed to be channeled through dance music. Nirvana’s 1991 release of ‘Smells Like Teen Spirit’ was a game changer, but it was Pavement‘s output between 1992-94 that was most impressive to these ears. ‘Gold Soundz’ was the second single from their second long player, Crooked Rain, Crooked Rain. It reminisces about those gold sounds; I am nostalgic for its sound. 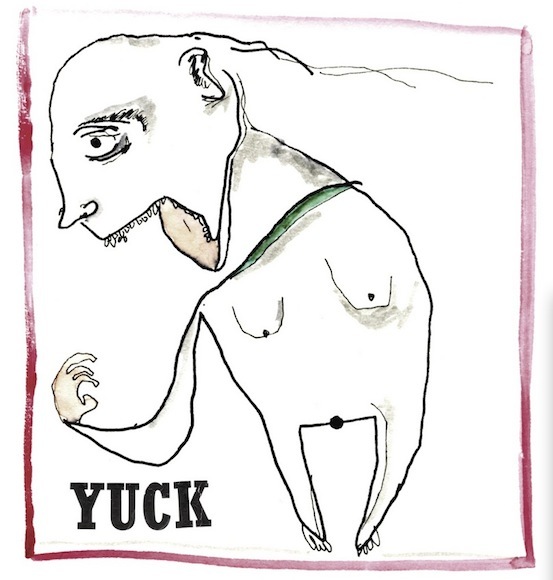 Another local SW London connection, Yuck played Kingston-upon-Thames in September 2011. I think that might be my only chance to get my home town into the blog. When they are not getting lost or selecting lamentable band names, Yuck are creating a sound reminiscent of Sonic Youth, Pavement and Smashing Pumpkins. ‘Get Away’ is the opening track off their self-titled debut album and it quickly sets out this stall of well chosen musical references. Pavement make me smile. Barmy lyrics, guitar din and lovely melodies – a strange brew. The 1994 long player Crooked Rain Crooked Rain was my introduction, followed by their more influential, noise-rock masterpiece Slanted and Enchanted. (I recommend this route to the uninitiated.) But it is the first track off their indulgent third album Wowee Zowee that I feature here. “There is no castration fear… pick out some brazilian nuts for your engagement…maybe we could dance together”. Just as with the Beastie Boys, I get the feeling that the sound of the words is more important than their meaning. Actually, nothing like the Beasties at all.